“Obtaining my professional designation has been a goal of mine for many years now. I am looking forward to the next stage of my career and continuing to work towards integrating all transportation users in a safe, efficient, and sustainable manner.” – Alyssa Peters, P. Eng. 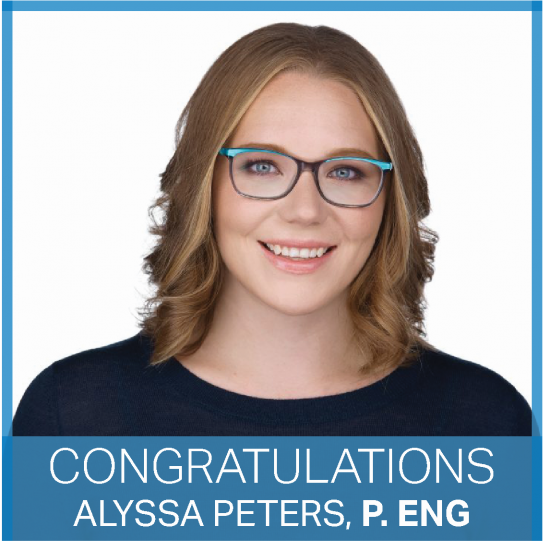 Bunt & Associates congratulates Alyssa on her milestone of becoming a Professional Engineer licensed with The Association of Professional Engineers and Geoscientists of Alberta (APEGA). Alyssa joined our team as a student intern and then full-time after graduating from the University of Calgary in 2014. In the four years since joining the Edmonton office, she has contributed on numerous projects as a highly valued team member and has displayed significant growth and professionalism.